Enter any establishment at any time, in any city around the world and you’re sure to see someone hard at work on a laptop, responding to email on a mobile device, or even participating in a video conference call via tablet. That’s because we’ve long since exited the era in which work meant you were strapped to a desk, plugged into the wall, or tethered to a landline. We can now work anywhere, from your home office or the local coffee shop to libraries and airport terminals. In fact, a Gallup survey recently found that 70% of people around the world work remotely at least once per week, and it’s predicted that 50% of the workforce will be remote by 2020. 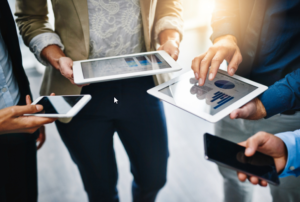 This ability to be mobile has led to increased need to have accessible files and data, yet many companies report that they are lacking the infrastructure to allow for this in a secure manner. Enter Microsoft 365, the new platform that will simplify accessibility, enhance security, and aims to stay one step ahead in protecting against vulnerabilities. We recently sat down with Susan Crincoli, Microsoft Practice Lead here at Applied Technologies, to learn more about Microsoft 365 and how they’re leading the way in empowering a secure mobile workforce through the modern desktop. Susan: Many people are probably familiar with Office 365, which includes applications like the Office suite, Exchange online, OneDrive and others. Microsoft 365 takes this to another level, adding Windows 10 as well as Advanced Threat Protection (ATP) to help guard against malware and viruses, device management like Intune and Windows AutoPilot, as well as additional authentication processes to access and share documents. The applications themselves are still installed on your desktop, while these advanced features are more behind the scenes. For example, your office data is online, in “the cloud” in multiple data centers in specific geographic locations most accessible to your users. This adds another level of security in terms of the physical security of your data. If disaster strikes one data center, there is a high probability that the others are unaffected. What are common questions you hear about Microsoft 365? Susan: Once people understand the difference between Office 365 and Microsoft 365, their questions begin to revolve around the security of their data. Most companies are still accustomed to having their own servers, and express concerns about moving data to the cloud where they fear it can be accessible by anyone. I explain how it works using the analogy of a house versus an apartment. There is a great deal of upkeep and many security measures that you personally must manage in a home. So much so that you may reach a point where you want someone else to do it for you, so perhaps you move from a house to an apartment. Here, you’re a tenant. You have access to only your apartment. You’re the only one with the keys, so your security belongs to you. You cannot access anyone else’s apartment, and no one else can access yours. Plus, someone else is managing the building for you, so you have less work and responsibility. How does Microsoft 365 enable for a higher level of security? Susan: In Microsoft 365, the built-in security features are the #1 benefit of the system. But it doesn’t stop there. The beauty of working on this platform lies in the continuous updates that take place. These updates are based on the risks assessed in the large volume of data that’s being housed and exchanged in Microsoft’s data centers, where the emails of thousands of companies on Office 365 are being transmitted. The data is continuously scanned to identify threats. The more data being scanned, the more quickly the algorithms are learning and building in protection. Therefore, the companies that are on the system are also learning from this collective volume. It would take much longer for an individual company to learn what threats they could be facing simply because the volume, and the experience with perceived threats, just isn’t there to assess and respond to. If a company did have this kind of volume, it would be nearly impossible to add the staff required to address every threat alert. Microsoft 365 manages all this through use of algorithms, so it’s automatic and proactive. What is the modern desktop, and how does Microsoft 365 fit in? Susan: The modern desktop is a mobile one that can be found on any type of computer or device that can securely connect to a company’s data. This could be a laptop, a home computer, mobile phone, or tablet. 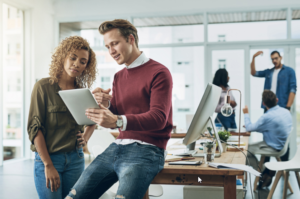 Workers and companies alike are finding an increased need to make connectivity, collaboration and accessibility possible. We find ourselves in a time where the remote workforce continues to grow, teams are located in offices around the world, and those who have a physical office are demanding the ability to connect while they’re off-site, wherever they find themselves at any given moment. Their modern desktop allows them to work efficiently and securely in these scenarios. Microsoft 365 was developed specifically with this in mind. It includes all the functionality of the Office Suite, the collaboration capabilities of Teams and SharePoint, and the added security features such as multi factor authentication to access data. In addition, new 365 features and updates are coming out once a month. This appeals to the tech needs and desires of today’s workforce, especially younger workers who are accustomed to having the latest and greatest. Microsoft is developing features we hadn’t even thought about two or three years ago, and users of the system are the first to be able to take advantage of the newest capabilities. Many studies show that workers value having access to the latest technology, while old technology makes them inefficient. How is Applied Technologies helping companies make the transition to Microsoft 365? Susan: We understand that this can be a new concept for many companies, and it can seem overwhelming. We’re helping companies navigate these waters, and identify the solution most appropriate for their needs from implementation to management of the system. Going back to the apartment analogy, we can do everything from helping them choose the right “apartment,” moving all their belongings (data, in this case), unpacking and setting it all up. Applied Technologies leverages a tried and true methodology for the transition process, and we’re able to move at the client’s pace. This process begins with a kickoff meeting, development of user lists and categories, communication templates to keep the end users informed, successful sync of active directories, migration of data, and implementation of software programs. Timelines vary based on how quickly the client would like to move, and how much time their in-house IT staff has to devote to the project. It’s a pretty straightforward process, but there are hurdles to overcome in every implementation. This is where our knowledge comes in. We know where the challenges are going to happen and can address them quickly. Once implementation has occurred, in most cases, clients will rely on us for our managed services, such as the Delegated Administrator. As part of managed services, we can help people know what’s coming and help them create policies around use, security protocols, how to respond to alerts, and ensure they’re following best practices. As new features are rolled out, new policies are rolled out to address them. What is on the horizon for Microsoft? Susan: In January, 2020, Windows 7 will reach its end of life, meaning that Microsoft will no longer support the system or provide updates. Users will either have to pay an extra fee to get support and receive patches, upgrade to Windows 10 on their device, or move to a new Windows 10 device. If they don’t, this opens a whole host of security problems as vulnerabilities in the program will not be addressed. We saw this when Windows XP went end of life. Companies who delayed upgrading faced security breaches and ransomware attacks. We anticipate that many users will transition to Microsoft 365 for this reason. The great news is that Microsoft has been very proactive about testing applications and is currently reporting that 99% of applications are compatible with Windows 10, which is the upgrade from Windows 7 and 8 Pro that are included as part of Microsoft 365 licensing. which is the version included in 365. This saves the client approximately $200 per device, and removes many challenges in the implementation process. Our goal is to help clients be ready and feel confident to embrace new technology, and eliminate the fear surrounding an implementation. The modern workforce expects this level of technology, and many have already come to rely on their modern desktop. As the job market continues to become more competitive, having these types of tools in place could have an impact on your employee recruitment and retention. Susan certainly painted an exciting picture of the many possibilities that Microsoft 365 can provide to your company and workforce. Her passion for sharing her knowledge shined brightly throughout our conversation. If you’re curious about Microsoft 365, or any Microsoft products or services, Susan and her team can help you understand your options and create a plan for implementing these great tools, giving your workforce the mobility they want and the security you need. Please reach out to the team at sales@appliedtech.pro or 636.274.8000 with any questions.